Is anyone else wondering where May went? It’s been an exciting month, though also with it’s tragedies as our thoughts go out to the people of Manchester. Delicious Gluten Free food and plenty of it. Some of my stories will be published in different anthologies this year. Exciting development (for me at least 🙂 ) – I have another 10,000 word Sci-Fi story accepted for another anthology. So watch this space! Until the end of the week, Heart of the Mountain is on sale at 99c USD. Fantasy adventure under the mountain – as the twins Retza and Delvina join with the abovegrounder, Zadeki, to save the underground realm from disaster. So, what else have I’ve been working on? Edits for Blood Crystal (Book 2 Under the Mountain) and Akrad’s Children (Book 1 Akrad’s Legacy). New short stories – both a couple of sci-fi shorts and some fantasy pieces. This Friday, I’ll be releasing the book cover of Blood Crystal … watch this space. Looking forward to an exciting year. Wishing you the best in your reading (and writing) adventures. Thrilled to receive my copies of Mixed Blessing Genre-lly Speaking anthology. This anthology with 65 authors and has flash fiction pieces in a range of genres: Romance, Mystery, Humour, Historical, Inspirational, Science-Fiction, Poetry, Adventure, Children, Young Adult. My Sci-Fi piece ‘Space Junk’ is part of the anthology – and it’s wonderful to see pieces from fellow Aussie authors – Christina Aitken, Anusha Atukorala, Deb Porter, Nola Passmore and Simon Kennedy. The Omega Writers Book Fair was a great day – I enjoyed reading the poem ‘A Long Time Ago’ from Like a Girl Plan anthology and an exciting excerpt from ‘Ruhanna’s Flight’ in Glimpses of Light. For more on the Book Fair check out this post or the event page. Three contributors to Glimpses of Light – Lynne Stringer, Charis Joy Jackson and myself attended the launch of the Books in Our Backyard 2015 catalogue in which Glimpses of Light is listed. It was an enjoyable night – especially running into to Avril Sabine (prolific fantasy author) and fellow Margie Lawson Immersion grads Raelene Purtill (fantasy) and Tania Joyce (Romantica). While I do spend most of my social media time on Facebook, Twitter and Goodreads – I’ve been having some fun with Instagram. If you frequent any of these, l’d love to connect with you there. It’s been great to see some good reviews of Heart of the Mountain. It was featured by Adam Collings on You-tube (about the middle), as well as on the Vince Review and a number of Goodreads reviews. I also had a chance to talk about writing Heart of the Mountain on the Write Flourish. I’m revising the sequel Blood Crystal, hoping to release it before the end of the year. The Herbalist’s Daughter was originally released in the Tied in Pink Romance anthology (Far Horizons, 2014). I’m currently offering a FREE COPY The Herbalist’s Daughter to anyone who signs up to the Jeanette O’Hagan writes Newsletter by the end of this month (30 September 2016). It’s been a busy few months. Thank you for your interest and support. Wishing you many hours of happy reading. At the end of July, I was excited to release Release of Heart of the Mountain: a short novella as a e-book (available at Amazon but also Kobo, Barnes and Noble etc). The launch was a lot of fun with over 20 people actively involved in the competitions and many receiving prizes. Reviews of Heart of the Mountain have been favourable – on the Vince Review, on Goodreads. and on Adam Collings (youtube). I’m currently working on the sequel in the Under the Mountain series – Blood Crystal – so watch this space. The year has been busy with retreats, courses, intensives and crit groups. Nola Passmore and I joined up in the QWC’s Year of the Edit with Dr Kim Wilkins in August last year. This online course finished up in July and was full of practical tips, practice and critiquing with a bunch of other great writers. We had fun looking at different aspects of our novels (Rasel’s Song for me). Omega Writers T oowoomba Retreat in May was a great time to catch up with old friends, make some new ones, learn some more craft and get some editing done. By far the biggest highlight has been a 5 day immersion class with Margie Lawson. This was intensive course, mostly 12 hours days as Margie shared powerful deep editing insights and gave valuable one-on-one time. I am excited about putting all I’ve learned into practice with my novels and stories. Raelene Purtill and I are organising Omega Writers Book Fair of local authors – just 2 days away now on Saturday, 3rd September. The last few weeks have been busy, busy, busy, but I’m thrilled with how things are shaping up – 16 stalls, 2 workshops with a range of books from children’s to adult, fiction and non-fiction including YA spec fic authors Lynne Stringer, Adele Jones. Raelene Purtill and Lisbeth Klein. Both Lynne Stringer and Adele Jones have new books ready to be released. Lynne has written a contemporary novel Once Confronted and Adele has her final book in her YA medical-science trilogy – Activate. Omega Writers Conference is coming up fast – this year in Sydney at the end of October. As part of The Heart of the Mountain launch – I offered an epub or mobi of ‘The Herbalist’s Daughter’ (originally published in Tied in Pink Romance Anthology) for anyone who signed up to Jeanette O’Hagan Writes newsletter – I’m extending the offer to the end of September 2016. Why not sign up now – either on the side bar or by following this link. It’s been a full and busy year and looking forward to new releases in the near future. I’ll keep you posted. On 14 January 2016 Like a Girl anthology was launched. Did you know Beatrix Potter, the famed author and illustrator of the much loved Peter Rabbit books, was also a ground-breaking scientist? It’s true (see here). In the past, women’s achievements were often not seen as significant or worthy of attention. Sadder still, even today girls and woman are less likely than boys to be encouraged to learn or to explore the talents and abilities they have been given. In Like a Girl, fourteen authors from around the world have contributed their stories to raise money for PLAN Australia’s support of girl’s education. Like a Girl is a celebration of the strength and resilience of women, told in a variety of genres and voices, the proceeds of which will help empower girls and women across the globe. It turns the derogatory term ‘like a girl’ on its head, celebrating the contribution girls and women can and have made. Like a Girl features stories and poems by Jeanette O’Hagan, Avril Sabine, V. Hartman Di Santo, Kathryn Hogan, Mary Grace, Coralyn Swift, Christina Aitken, Mark Taylor, D.L Richardson, Mimi Emmanuel, Erin Yoshikawa, Druscilla Morgan, Michelle John and Mirren Hogan. They use intelligence, humour, adventure, imagination and deep emotion to explore themes of resilience, determination against odds, empowerment, significant relationships and women’s achievements. Why Girl’s Education is important to me. My poem ‘A Long Time Ago’ in the Like a Girl anthology, is drawn from my own school day experiences. I’m glad that, I not only had to the opportunity to finish school and go on to university, but that both my parents encouraged me to learn and to pursue my dreams. Over the years, I’ve practiced medicine, taught theology, and am currently raising a family and pursuing my love of writing fantasy, poems, social commentary and blogging about life and writing. The story I wrote for LAG, ‘Lakwi’s Lament’, is situated in the narrative world of the Akrad’s Legacy series (the first book due to be published in 2016). It explores the tension between a girl’s desire to learn and what her family and community expects of her. Like a Girl is available from Amazon and other outlets. This post is the first step in the Like a Girl Plan anthology blogtour which will include reviews, reflections on the importance of education or women, prizes and giveaways. (See below). Profits from this engaging anthology go to Plan Australia’s efforts to support and improve girls education. Today, I’m giving away a copy of Like a Girl to the person (not involved in anthology) who leaves best comment on the positive impact of girl’s education either personally or in the life of someone connected to them. This competition is open until 1 February, 2016. Winner to be announced on this blog. Three other copies of Like a Girl are on offer through Like a Girl Rafflecopter. The next step on the Blog Tour is with multi-published, award-winning author of intriguing and thought provoking New Adult inspirational fiction, Paula Vince. I love Paula’s stories and am looking forward to her post on Monday 25 January 2016. You will be able find it here. Don’t miss out on the opportunity to participate in prizes and giveaways, but more importantly, to be entertained and moved while supporting a worthy cause. for winning a copy of Like a Girl anthology in my recent Glimpses of Light Blog Tour Giveaway. Be challenged, captivated and moved by these imaginative reflections on faith, help in time of need, joy in the midst of tragedy, and surprising encounters with God. During 2015, the International Year of Light, twenty-one authors from Australia and the United States have come together to explore the theme of ‘glimpses of light’—finding light in dark places—through short stories, poems, flash fiction and creative non-fiction. 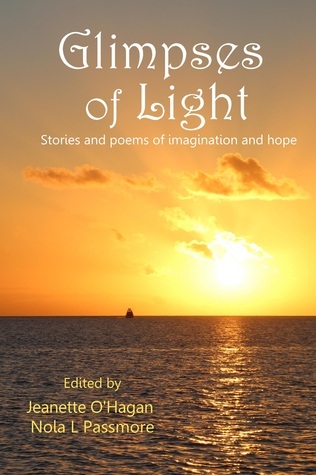 Glimpses of Light includes contributions from respected and award-winning authors and poets Jo-Anne Berthelsen, Paula Vince, Lynne Stringer, Adele Jones, Jo Wanmer, Jeanette Grant-Thomson and Ellen Carr, as well as exciting new talent. Profits from this anthology go to CBM Australia, giving sight to the blind. Fourteen Authors from around the world have contributed their stories to raise money for PLAN Australia. ‘Like a Girl’ is a celebration of the strength and resilience of women, told in a variety of genres and voices, the proceeds of which will help empower girls and women all over the world. Featuring stories and poems by Jeanette O’Hagan, Avril Sabine, V. Hartman Di Santo, Kathryn Hogan, Mary Grace, Coralyn Swift, Christina Aitken, Mark Taylor, D.L Richardson, Mimi Emmanuel, Erin Yoshikawa, Druscilla Morgan, Michelle John and Mirren Hogan.